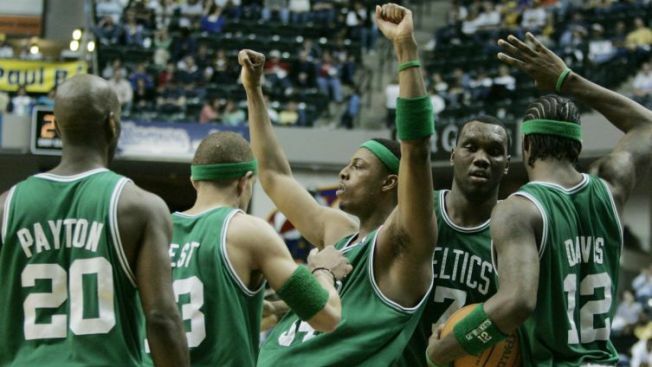 The Boston Celtics are one of the most storied franchises in NBA history, but that history does not include a ton of playoff games against the Indiana Pacers. When the two square off this weekend in their first-round playoff series, it will mark only the sixth time these two have met in the postseason - and the first in more than a decade. Here's a look back at the five playoff series between these two franchises, a series which the Celtics lead 3-2 with every matchup taking place in the first round. As the No. 2 seed, the Boston Celtics came in as the overwhelming favorite against the seventh-seeded Indiana Pacers, who were led by Reggie Miller and Chuck Person. Meanwhile, Boston's success at that time was fueled by Larry Bird, Robert Parish, and one of the game's rising stars at the time, Reggie Lewis. Boston opened with a 127-120 win at home in Game 1, but soon found the series tied at 1-1 following Indiana's 130-118 upset victory in Game 2. Chuck Person lit up the Celtics for 39 points while Michael Williams chipped in a double-double of 24 points and 10 rebounds for Indiana. The difference in Game 2 was the 3-point shot as the Pacers connected on 9-of-13 from beyond the arc while the Celtics missed five of their six 3-pointers attempted. With the series knotted at 1-1, Game 3 was another hard-fought battle that ended with Boston prevailing 112-105 with all five Celtics starters scoring in double digits while Kevin McHale led the way with a game-high 22 points off the bench. Larry Bird, who had battled an assortment of injuries all season, went to the locker room at one point in the pivotal Game 5 matchup only to return to action and eventually finish with 32 points as Boston moved on to the second round with a 124-121 victory. In what was Larry Bird's final season, Boston finished the regular season with a flurry to claim the Atlantic Division crown and with it, the No. 2 seed in the playoffs. And that put them on a collision course with the Indiana Pacers for the second straight year. The previous year saw the Pacers push the Celtics to the brink of playoff elimination before Boston advanced by winning the best-of-five series, three games to two. But 1992 was a different story. After a relatively close Game 1 matchup for three quarters of play, Boston broke open an 87-all game going into the fourth to pull away for a 124-113 win. Leading the way for Boston was Reggie Lewis' game-high 36 points, with Kevin McHale and Kevin Gamble chipping in 21 and 20 points, respectively. Game 2 was yet another matchup in which the Pacers gave Boston all it could handle with the game needing overtime before a winner prevailed. Unlike the previous year's Game 2 tilt that ended with an Indiana win on the Boston Garden floor, the Celtics weren't having any of that this time around as they pulled away in the overtime session for a 119-112 win. The hero of the game for Boston was former Boston College star John Bagley who dropped a game-high 35 points. Like Games 1 and 2, the Pacers gave the Celtics all they could handle for most of the game. But when it mattered most, the Celtics were the better team as they closed out the series with a 102-98 win as Reggie Lewis led all scorers with 32 points and Bagley had a double-double of 14 points and 11 assists to go with seven rebounds. This was indeed a watershed-type season for the Boston Celtics, who were under new ownership led by Wyc Grousbeck. It was also one of the few playoff series in which the Celtics came in as the lower-seeded team. After a strong start to the season, Boston couldn't maintain that level of play and eventually wound up as the sixth seed facing the third-seeded Indiana Pacers, who were led by Reggie Miller and Jermaine O'Neal. Boston didn't waste any time stealing home court away from the Pacers, as Paul Pierce delivered a 40-point, 11-rebound, six-assist performance in leading Boston to a 103-100 upset win in Game 1 on the Pacers' home floor. In a must-win Game 2 matchup, Indiana set the tone early and maintained control for the game in winning 89-77 as Jermaine O'Neal had a monster double-double of 23 points and 20 rebounds. The Celtics were disappointed in the Game 2 loss, but headed back home with what they ultimately wanted more than anything: home-court advantage. And it didn't take long for the C's to put that edge to work in their favor with a dominant first-quarter showing in Game 3 that would be too much for the Pacers to overcome as Pierce came up big yet again in Boston's 101-83 win. Pierce was just 5-for-8 shooting from the field, but wound up with 21 points, 12 rebounds and five assists in the victory that put the Celtics ahead 2-1 in the best-of-seven series. In Game 4, Boston struggled to score in the first half which was exactly what the defensive-minded Indiana Pacers needed in order to even up the series. But the Celtics were a different team in the third quarter. After having scored a total of just 36 points in the first half, Boston erupted for 37 points in the third quarter. Yup. It was Pierce, again. He would finish the game with 37 points, but 21 of them came in the pivotal third quarter which set the tone in Boston rallying for a 102-92 win. The Celtics seemed well on their way to ending the series in Indiana. But the Pacers, trailing by nine going into the fourth quarter, rallied to tie Game 5 up in the fourth and leaned heavily on their strong defense to prevail with a 93-88 overtime win in which the Celtics did not score a single point in the extra session. Returning home with a 3-2 series lead, there was no denying the Celtics felt they should have ended things in Indianapolis in five games. And they opened Game 6 with the kind of fire and fury that just totally consumed the Pacers in a way that - truth be told - put them away quickly. By the time the final horn sounded, Boston had a resounding 110-90 win and moved on to the Eastern Conference Semifinals to face the New Jersey (now Brooklyn) Nets. This was a tumultuous season for the Celtics, one in which the playoffs didn't seem a likely final destination. Jim O'Brien got off to a rocky start to the season as the Celtics' head coach and eventually quit after a lackluster 22-24 start. The losses began to mount, seemingly putting Boston on the fast track to land one of the top big men in the draft that year, high school phenom Dwight Howard or UConn's Emeka Okafor who would eventually be drafted with the first and second overall picks, respectively. But the Celtics managed to string together just enough wins to squeak into the playoffs as the eighth and final playoff seed with top-seeded Indiana awaiting them. The Pacers had no problem putting the Celtics and their not-so-great season, out of their misery quickly with a 4-0 series sweep with an average margin of victory for Indiana being 16.8 points per game. In Doc Rivers's first season as the Celtics' head coach, they finished first in the Atlantic Division, although their 46-36 record relegated them to being the third seed in the East. Boston raised the hopes of its fan base with a dominant 102-82 win in Game 1, only to come back to earth in Game 2 when the Pacers held the Celtics without a field goal for the final 2:41 of play to edge Boston 82-79. Back in Indiana, the Pacers picked up where they left off and delivered an emphatic 99-76 loss that put the Celtics in a 2-1 series deficit. Well, Game 4 represented the third time in the series in which the victor won easily as Boston handed the Pacers a 110-79 loss to even up the series at 2-2 but just as importantly, swung home-court advantage back in Boston's favor. But that didn't last long, as the Pacers came into Boston and won for the second time in the series on the Celtics' home floor, this time by the tune of 90-85. The game turned into a defensive struggle for both teams, but it was the Pacers making all the big plays down the stretch which included a 3-pointer by Stephen Jackson that made it an 85-80 game with 2:36 to play that would prove to be too much for Boston to overcome. Who makes A. Sherrod Blakely's All-NBA teams? Back in Indiana with the Pacers having a chance to end the series on their home floor, Boston was not ready to have their season end just yet. After a tightly contested battle for four quarters, the score was knotted at 84-all resulting in an overtime session. Both teams exchanged baskets in the first minute of overtime, but a 3-pointer by Antoine Walker put the Celtics ahead 89-96 with 3:04 to play in overtime. Walker, who finished with 24 points and 11 rebounds, made a short 9-foot jumper that put Boston on top by four points, 91-87. Jamaal Tinsley scored with about 30 seconds to play, but that would be as close as Indiana would get on a night when the Celtics did just enough to leave with the win and more importantly, tie the series at 3-3. In a series that had seen it all - blowouts, overtime thrillers and everything in between - Game 7 proved to be yet another game that didn't go quite as planned. Despite being at home for Game 7, the Celtics were absolutely thrashed by the Pacers to the tune of 97-70. You hear all the time about how the NBA is a make-miss league. Well for most of Game 7, it was a miss-miss game for the Celtics who missed a ton of shots and in doing so, missed out on a chance to move on to the next round of the playoffs despite having home-court advantage in their first-round series.